Though actor Forest Whitaker started college on an athletic scholarship, the charismatic and award-winning performer made the unlikely shift from football to studying to become a classical tenor and eventually, an actor. After gaining some attention in several stage musicals, Whitaker made an immediate impression with a small, but memorable role in his feature debut, “Fast Times at Ridgemont High” (1982). Following a quick succession of supporting roles in features and on television, he earned his first wave of critical accolades for his portrayal of drug-addicted jazz alto saxophonist Charlie Parker in “Bird” (1988). Once he was established as a viable leading man, Whitaker easily oscillated between low-budget and studio projects, earning equal acclaim for his performances. Taking his career to the next level, he made several earnest, but ultimately mediocre forays into feature directing – most notably “Waiting to Exhale” (1995) – but continued to churn out one sterling performance after another until finally reaching new heights with his Oscar-winning portrayal of Ugandan dictator Idi Amin in “The Last King of Scotland” (2006), which came hot on the heels of another mesmerizing performance as an obsessive internal affairs officer on season five of “The Shield” (FX, 2002-08). Both roles only confirmed what many had already known – that Whitaker was one of Hollywood’s most versatile, surprising and talented actors of his day. Born on July 15, 1961 in Longview, TX, Whitaker was raised by his father, Forest, Sr., an insurance salesman and his mother, Laura, a special education teacher. When he was just six weeks old, his parents moved the family from Longview to South Central Los Angeles, where he stayed until he was 11 when they moved again to nearby Carson. By the time he was in his teens, his parents – particularly his mother – wanted him to attend high school somewhere other than in Carson or next door Compton. So he was bused instead to Palisades High School – a two-hour commute each way – where he was an all-league defensive tackle on the football team and used his rich tenor voice to perform in school musicals. After graduating, Whitaker earned a football scholarship to California Polytechnic Institute in Pomona, but opted instead to attend the University of Southern California Conservatory on a vocal scholarship. Meanwhile, he began performing in several productions around Los Angeles, including “School Talk” at the Mark Taper Forum, as well as “Jesus Christ Superstar” and “The Beggar’s Opera,” both at the California Youth Theater. After an agent saw him performing, Whitaker dedicated himself fulltime to acting. He secured another scholarship, this one for the Berkley branch of the Drama Studio London, then landed his first onscreen role, playing an enraged football player in Cameron Crowe’s classic teen comedy, “Fast Times at Ridgemont High” (1982). Whitaker was briefly sidetracked from features with a string of television appearances, including the six-part miniseries “North and South” (ABC, 1985), as well as episodes of “Diff’rent Strokes” (NBC, 1978-1985; ABC, 1985-86), “Hill Street Blues” (NBC, 1981-87), “Cagney and Lacey” (CBS, 1982-88), and “Amazing Stories” (NBC, 1985-87). Back in features, Whitaker appeared in the sports-themed drama, “Vision Quest” (1985), then gained considerable notice as a charmingly duplicitous billiards opponent of Paul Newman in Martin Scorsese’s “The Color of Money” (1986). More supporting feature roles followed, including “Platoon” (1986), “Stakeout” (1987) and “Good Morning, Vietnam” (1987), in which he more than held his own opposite Robin Williams as his likeable sidekick. Whitaker graduated to leading man status under the direction of Clint Eastwood for the dark biopic “Bird” (1988), earning Best Actor honors at the Cannes Film Festival for his compelling portrayal of doomed jazz legend Charlie Parker. Do you want to hire Forest Whitaker? Directly request a quote. In 48 hours we can send you the availability of Forest Whitaker If you would like to book Forest Whitaker, Entertainment Booking Agency is the right place. 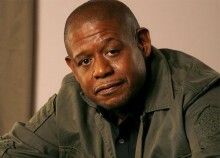 We will offer you the best price and contact the management or we directly contact Forest Whitaker. For corporate appearances or speaking engagements you can contact our agents and the will help you true the process. Tags: hire Forest Whitaker, Forest Whitaker booking, book Forest Whitaker, Forest Whitaker appearances, find more information on booking Forest Whitaker for appearances, Forest Whitaker speaking engagements, Forest Whitaker endorsements/spokesperson, Forest Whitaker appearance fees, Forest Whitaker booking agency contact info, biography of Forest Whitaker, Contact an artist booking talent agent find a speakers bureau that can book Forest Whitaker, speaker booking agency for Forest Whitaker, Forest Whitaker booking agency, Forest Whitaker booking for corporate event. EBA is one of the biggest entertainment booking agencies in the World. We book hundreds of celebrities, artist, athletes and speakers in a year. Important to know is that we are not claiming to be the management of Forest Whitaker. We are not the official agent for Forest Whitaker. Companies from around the globe book these artists and speakers true our company be course we have one of the biggest networks and we always have direct contact with the artist or the management. We help you to find the right celebrities for your corporate of private events. Please contact one of our agents to get free advice and we will help to get the world-famous artist on your party.